BERNARD O CALLAGHAN MEMORIAL SENIOR FOOTBALL CHAMPIONSHIP. ROUND 1. Before the game got underway there was a minutes silence observed for the late James “Gus” Cremin, Ballydonoghue, former Kerry Footballer. Played in perfect conditions at Stack Park, Ballybunion on Saturday last Beale after a somewhat topsy turvey performance proved too much for an Asdee side who had great expectations but who only came to life in the final 10mts or so causing some anxious moments to the Seasiders who managed only 1pt in that final 30mts. However there is no denying but that the Seasiders were always the better side but will have to address their scoring problems if they hope to advance to the latter stages of the competition. They have a terrific side with everybody giving 100% but there is no doubt but wing forward Andy O Connell was the toast of his sides latest victory displaying some superb wing forward play along with been involved in both goals having hammered home the second. Still this was not a one man team performance as already stated because Tom Hayes, Philly Blake Padraig Murphy, Jeremy King, Declan Bambury, James McMahon and Ian Mannix to mention a few were excellent. Asdee in fairness won their fair share of possession but when it came to the scoring department they were always struggling against a well marshalled home defence; Eoin Tydings, Darren Russell and Darragh Keane were the pick of their attack despite both John Doran and Padraig Ruddle holding their own at midfield. Defence stood firm against many Beale attacks and here Eoin O Carroll, Micheal Tydings and Con Carmody stood out; certainly the introduction of Noel Long in the second half was to pay dividends and was probably the tonic they may have needed earlier than his arrival. The game itself opened at a hectic pace and Ian Mannix was fouled inside the opening minute but the usually reliable Jeremy King shot wide from a scoreable position. Two wides followed for the home side before Eoin Tydings slotted over an excellent point for Asdee in the 6th minute. An off the ball spotted by Referee John Ross resulted in James McMahon splitting the posts to level up matters after 9 minutes. After Asdee holding their own up to this stage of the game suddenly it all went wrong; it took a vital interception from Con Carmody to deny what looked like a certain goal for the Seasiders before Jeremy King had the white flag waiving for Beale. It was all Beale now and after an Ian Mannix rasper came off the upright it fell perfectly for Jeremy King to billow the net from close range at the end of the first quarter. A minute later Man of the Match Andy O Connell who had been causing all sorts of problems for the visitors defence was put through by Barry O Mahony and he made no mistake finding the net. Andy O Connell struck again immediately to put the ball sailing over and after 18 minutes it was Beale well in control leading 2-3 to 0-1. Mike Breen with 2 pointed frees kept Asdee in contention but in between Conor Coughlan had to be alert to stop Ger Gorman finding the net. The final score of the game came in the 29th minute when James McMahon set up Barry O Mahony for a point to leave the half time score; Beale 2-4 Asdee 0-3. Beale got off the mark in the 4th minute of the second half when Ger Gorman kicked a massive point from the sideline almost 35 meters out on the stand side of the field; however its hard to believe but this was the only score they registered for the duration of the encounter. It took until the 14th minute before Asdee pointed when Eoin Tydings oblidged with a point and now the visitors were finding the form which was expected of them. Playing a lot better they took the game to the pre match favourites but were finding it hard to put scores on the board but again one must credit the home defence who were always on top. Darren Russell point narrowed the gap further as tempers got a little out of hand but was quickly put out. At this stage it was Asdee who were in control but lady luck denied them at least one goal when Darragh Keanes shot was smothered and cleared to safety. Beale were holding firm and kept their goal intact as Asdee had to rely on points from Darren Russell and a Mike Breen free to close the scoring. Overall a competitive enough game but Beale were for the bigger part of the game dominant and fully deserved their victory. 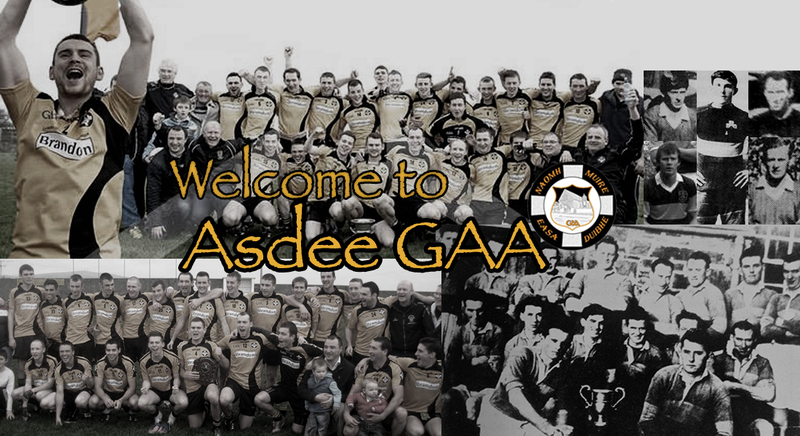 Asdee; Conor Coughlan, Eoin O Carroll, Martin Collins, Con Carmody, Kieran Kelly, Michael Tydings, Charles Dalton, John Doran, Padraig Ruddle, Darren Russell, 2pts, Eoin Tydings, 2pts, (f), Michael Walsh, Mike Breen, 4pts, (f), Darragh Keane, Eoin Kennedy. Subs, Noel Long for Michael Walsh, David O Connor for Kieran Kelly.